Immediate thoughts on 'atonement'. Why put 'atonement' in scare quotes? To recognize that every word we use, especially loaded words, is interpreted by us in our own inference engine - brain, culture, and language processed together in ways we are largely unconscious of. The stimuli for this post is Christian Brady's recent post and his sermon (referenced in the post). Brady asks: Was the Passover sacrifice an atoning sacrifice? and answers No. The one word answer has a short explanation and a few comments so far. His sermon is an important read. In it he notes several specific roles for a sacrifice, and implies we ought to know more about the Hebrew sacrificial system - in order to 'understand' where they are coming from. Can we only understand from a position of 'having been reconciled'? Do all of us have some example of reconciliation with another / others from which we can see? If we do not (Oligarchs, kleptocrats, and rulers who abuse their people), is there any 'salvation' for such? If we did 'understand' would it do us any good? Yes, I think so, to the extent that our understanding is a germ that works within us to change who we are and how we act. Understanding sacrifice, atonement, salvation, reconciliation... where does one start? It is clear that some people do behave this way. The international scene is rife with examples. If there is such a thing - is it desirable to know it? Self-interest is at the root of this question. When I was a young believer (in what? you say), in what I then perceived to be the message of the Christian church in Toronto, I (we) came home, one evening, wondering who would baby sit our children. A young woman said hello to us, one whose situation had not been appealing in the past. The words came to us from the ether: if you believe, why do you not trust her to sit for you? That is a sufficient beginning. The atenach ^ is a sign of rest. In the music, it is the subdominant. The music comes to a rest at that point. In traditional plainsong, there may be a 2 beat pause. It is rare that there is no atenach in the verse [1641/23150 in the WLC]. I have [had at this time] noted only a few places so far where they are missing and the verse is essentially one thought without pause. 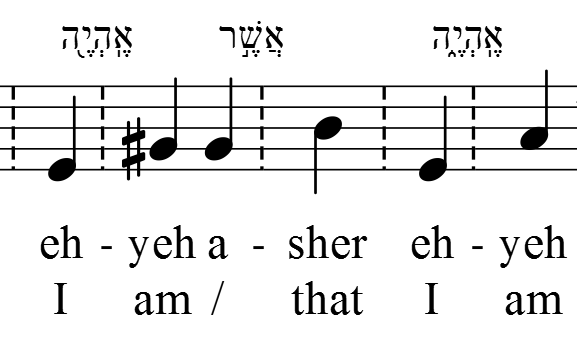 But I was just redoing the first secton of the Song since I had changed my technique and wanted to include the Hebrew. Because of a quirk in the music program, when I copy and paste (carefully due to other quirks), I have to re-enter by hand all the breath marks (they do not get copied). As I was doing this, I noted that most of the verses in this first part of the Song have no atenach. The lovers are not at rest. You might be curious to know where the verse come to a rest in this love song. The music is in the usual place. Verse 1 - no rest. Verses 3 and 4 have a rest - and I have assigned them to the chorus since they all contain a first person plural. Verses 5 to 8 have a rest. Verse 9 to 17, 2.1-2 have no rest. This is very unusual. 2.3, 5, 7 have a rest. It appears that love may be at times restless! I had been wondering for 4 years where the name Yad Vashem had come from. I did not know that this phrase was in the Bible (and though I was wondering, I obviously didn't work at it). The use of Yad (hand) in this context combined with Shem (name - the va is a connector) occurs at least twice according to his pointer, 2 Samuel 18:18 and Isaiah 56:5. In the King James Version, in both passages, the idiom for Yad is rendered as a place and in Isaiah, Shem is a name. It is easy to see though how memory and reputation is contained in these English glosses. In the Jerusalem Bible 1962, 2 Samuel is rendered Absalom's pillar (Yad! 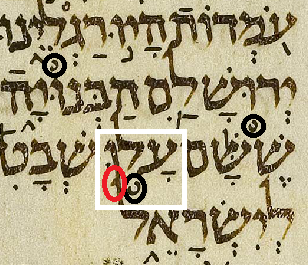 ), implying that pillar is repeated 3 times in the verse (though the Hebrew for pillar only appears twice). Nonetheless, the concept of memorial is contained in such an image. Verses out of context, whether literally or freely translated, do not carry their full weight, but the weight of this concept of remembering is carried by the name of the Holocaust memorial, Yad Vashem, in Jerusalem, a place which Diana and I visited in 2010. Of course memory and knowledge of memory is central to the Bible's message and through the process of sacrament, memory is central also to Jewish and Christian worship. Memory is an explicit component of the Name of God YHWH as we saw in yesterday's post. Remembering is also a theme in the Psalms, particularly Psalms 6, 38, 70, and 137. It is there in the feast of Passover and the making present of the past that is in that tradition. And it is clear in the Eucharist, making present the death of Jesus. Remembering is more than an idle thought. My stimulus for this post is here from Jim Davila. And here is the music for the two passages - hah! As a demo for a friend, I illustrated the duplicated passage in Isaiah and Micah about swords and plowshares. As the width of a car is roughly equal to the width of a pair of horses, so the page width of a letter allows a musical bar of 24 beats on one line. How many beats can one sing for a single thought to be expressed? To date in my cursory review of musical form in the music of the te'amim, I have not seen a bar longer than 23 syllables. Exodus 3:15 has 21 as its longest bar. Here it is - (bar 146). 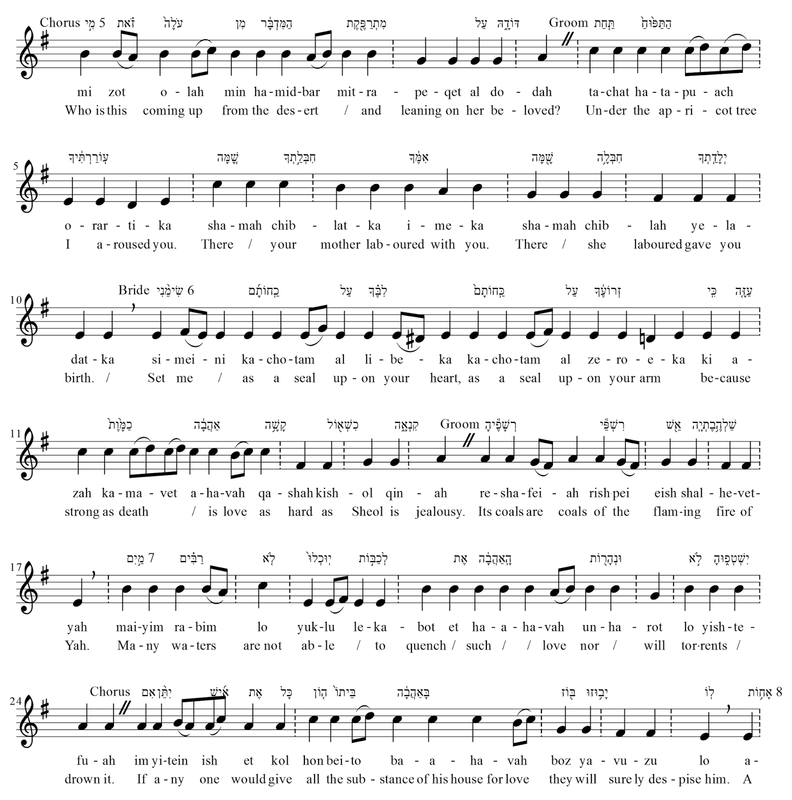 In contrast to these long bars, each one driving the singer forward to the next change in reciting note, the revelation of the divine name has very short bars. I haven't got this section in my word analysis database yet, so I wonder how the rhetoric moves around these words. The affliction of Egypt and the list of nations (verses 7-8 and 17) seem to provide a significant bracket of repeating words. Within them, verses 9 and 16 fit as a second envelope. Verses 10-14 contain the core dialogue ending with the revelation of the Name. Verse 15 has the significant nature of the name as memorial. The phrase generation to generation is lacking a letter. While translating, I noted a sudden shift to a singular third person object in verse 7 - his taskmaster, and his sorrow singular. Israel is one and Egypt is one in their person or the pronouns should be interpreted as plural as KJV does - but this smooths over the problem and no reading happens. If you are interested in the whole section, there are images at the shared location here. The full text in Hebrew and English with an English and Hebrew underlay and also showing the cantillation symbols as deciphered by Suzanne Haik-Vantoura is now available at the shared location in PDF form. Who would want to sing or to interpret that ancient song? Better question, who would want to be sung about as in that ancient song? Is Solomon really the lover? Only to the extent that he fills the role assigned to him in Psalm 72. And as historical king, he fails in this role - too many wives, to many horses, too much economic power. Solomon like other rulers then and now ruled by power for his own sake and began his reign with murder. Don't think it is only national sovereigns that do such things. Count the oligarchs and the kleptocrats and all the self-interested of the earth in these roles. Solomon gets a little word play since his name means peace. It has the sh-l-m sound in it. So also we have the Shulamite, who we identify with the bride, and the foxes - shu-alim, that have the same sound but separated by a guttural. These sounds frame the poem. But the central word-play of the poem is in the animals, the hart and the roe that sound like God and hosts. I have tidied up the text quite a bit and changed the translation to match the music somewhat - where feasible. See the text alone with the links to my work in 2010 (updated) on the right hand side of the page beginning here. I still have a few notes on my memories, reaching back into a distant life that began in earnest in me some 40 years ago in my late twenties. Fearful, confused, yet responsible to my obligations, I began to learn about the one they called 'the' Anointed. It was a closed-table brethren assembly that first converted this Anglican - but I was never 'in' that assembly, nor did they ever fully convince me of their 'logic'. In my previous note on this, I found the article on Plato and the maleness of logic very helpful in seeing how the words of the logic of the assembly fell into a Greek and masculine mold and not into the unity that is in the Anointed as is so powerfully modeled in his prayer of John 17:21-23. We cannot get by without some words - even religious words. Don't worry if they make little sense for the moment. They will sink in. In Psalm 146, we have come to know this Yahweh better as one who saves people in trouble - and we know there are plenty of troubles and plenty of peoples in them. So how do we make a difference then? ... keeps truth forever, does judgment for the oppressed, gives bread to the hungry, releases prisoners, gives sight to the blind (I will be coming to this with cataract operations soon! ), uplifts the disturbed, loves the righteous, shelters the guest, restores orphan and widow, and subverts the way of the wicked (paraphrased). This catalog of Yahweh's actions is a substantial prayer. All this is simply to say that the 'mystical' is not an insubstantial wisp of air but a grounded, action-centered, growth that has content and direction. Another name for faith, hope and love. There is yet more to say. Perhaps most important is the question: is the analogy of substance, the doctrine, 'derivable' from the text? In a word - No. The word creates. We do not derive as if by our own logic. Do we therefore impose the experience of being created, our experience, onto the text? In part, yes, we do. Where then is the cusp of origin? Is it random, like the sowing of a seed? This is the image used of the word. I find myself assigning the final verse to the chorus whether or not it is in the voice of the chorus. This is because I want no observers, but that all may identify in the unity of Zion, the Bride. For there is no exclusion in the love that is in the Song. So Part 3 is available here. It is long. To Song 5:8. Behold, I tell you a mystery, ... 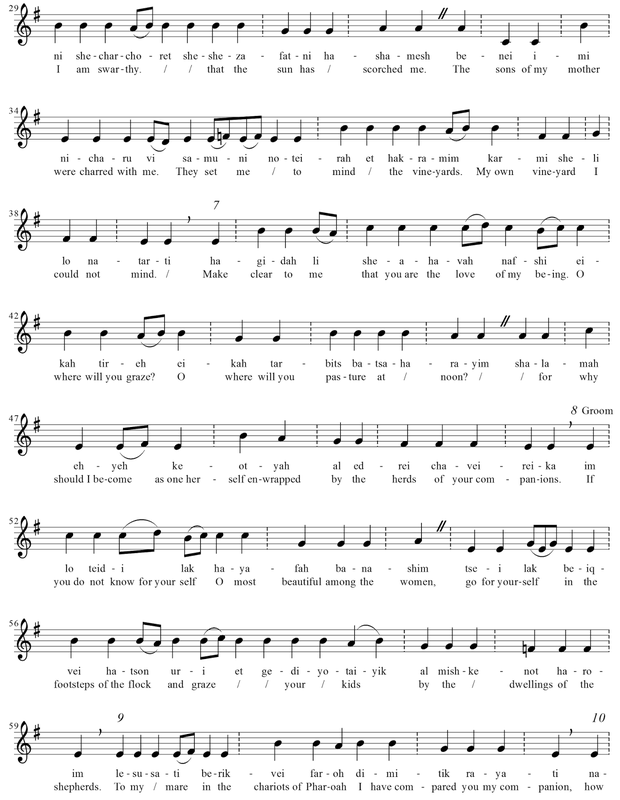 So begins the great pre-Psalm 2, pre-Hallelujah chorus recitative by the bass in the Messiah by George Frederick Handel. Well now - isn't that just a contradiction in terms? - I tell you a mystery. If it can be told then it is by definition no longer a mystery. No need to explain this contradiction away - just live with it. Consider three horses: Plato's, Lewis's, and the horse of Psalm 32. Plato's is in the charioteer myth of the Phaedrus (more fully explored in JBL 133, no 1 (2014) p 148, The Passion of Eve and the Ecstasy of Hannah.) In too few words - the horse in this image in Plato prevents the separation of the soul from the body. The horse, representing non-rational or irrational passion, is unruly and must be mastered. Now I caution you, I have no intent with respect to a separation of soul and body. You are your whole self, your whole being. I am not a dualist and this is a dualist image leading to the denigration of the body, completely the opposite of life, faithfulness, and responsibility. But the image is useful since it is used by Lewis in The Great Divorce, where the rat (representing irrational passion, pace negative images of this poor creature) on the soul's shoulder must die that it may be changed into a stallion (representing the power of transformed passion) that will carry the 'soul' to the beatific vision. Now I am leading up to something - that trumpet that will sound and the raising of the dead - incorruptible - that we shall be changed. Is this mystical, or explanation, or even sensible? How is it known? Sensible and known are helpful terms - but live with them, do not aim for a packaged spiel. Inner dialogue and outer knowledge are not to be packaged. The enfleshment of that faithfulness is not itself to be assumed as controllable as if it were a box of crackers which, to be useful, has to be unwrapped and the package recycled. What do I not 'believe'? I do not believe that for instance Isaiah was written by one author. (What!) No, this 'book' like most of the books of the Old Testament has a redactional history and is a collection of texts written over many years and more than one lifetime. A recent article on the Bible Gateway blog presumes that Isaiah 'prophesied' Cyrus as Messiah. The writer assumes a single early author and prophecy as prediction. Yes - but just what does he imply? What this kind of reasoning does with the Old Testament, inadvertently, is to destroy its reality. What do I believe? Yes, there are types and shadows - but the reason for them is not prediction. Try this - the OT reveals the same life (in abundance) as is revealed by the NT but revealed (from our temporal point of view) in advance of an unambiguous demonstration of that life in what Jesus called his 'work' and his 'hour'. There is in this testament from an earlier era, a foretaste of bodily and sensible 'resurrection', just as there is in that testament from the later era. Such life has always been the same, yesterday, today, and for ever. The OT is no more legal nor violent nor primitive nor sophisticated than the NT. They are both testimonies to a life that gives importance to its consequences. This life is given by the word of God, but many words of testimony and searching follow the gift. That testimony and searching for words is what has been 'canonized'. The canon does not preclude other testimonies equally valid in their experience and searching. But the canon (OT + NT) is sufficient to its task. There are otherwise too many words. So we come to the third horse, that of Psalm 32. We are not to be like horse or mule that has no understanding - and here 'understanding' is not our own minuscule power of logic, but release from trouble and from the powers that bind us. 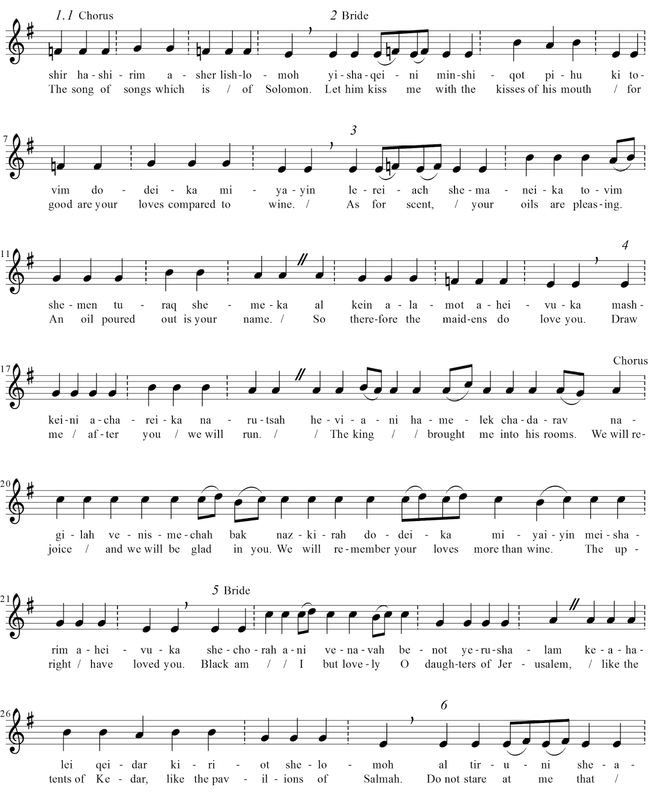 Psalm 32's music (full score here) is very revealing. Diminished fifths paint the bucking animal. The desire of the anointed poet is that we should come near to God. That will do for part 1 - I wrote many notes and I have used only the bit about the horses. Pull my words apart if you like - let me know what you think. In the mystery of the incarnated mystic, I think words are secondary in that they follow experience and gratitude and lead to greater experience and gratitude - such as is, of course, expressed in the Psalms. Were we led all that way for birth or death? ...this Birth was Hard and bitter agony for us, like Death, our death. And ultimately, of course, what religion is really about is nothing, since we are nothing but meaningless, statistically organized matter bouncing around in empty, dead space. This materialistic view of all reality will not hold even if one is a scientist. The gaps in our scientific 'knowledge' are great and are greater than our capacity in the mode that science observes. Well - what then? (Read the response to the review of this article as well). Why would I pursue the setting of the Song of Solomon to ancient musical form? Answer: so that we don't pursue 'meaning' with our blinkers on and our ears plugged. If we are to seek 'meaning' without being demeaning, without forcing the reduction of narrative to our limits, then we will have to be entranced into it, immeasurably moved out of our measurable universe. By the way - I am not so sure that mystical is a good term for whatever it is I want to move into. There is no lack of incarnation. I have repaired the alignment of my 2010 translations (see sidebar). 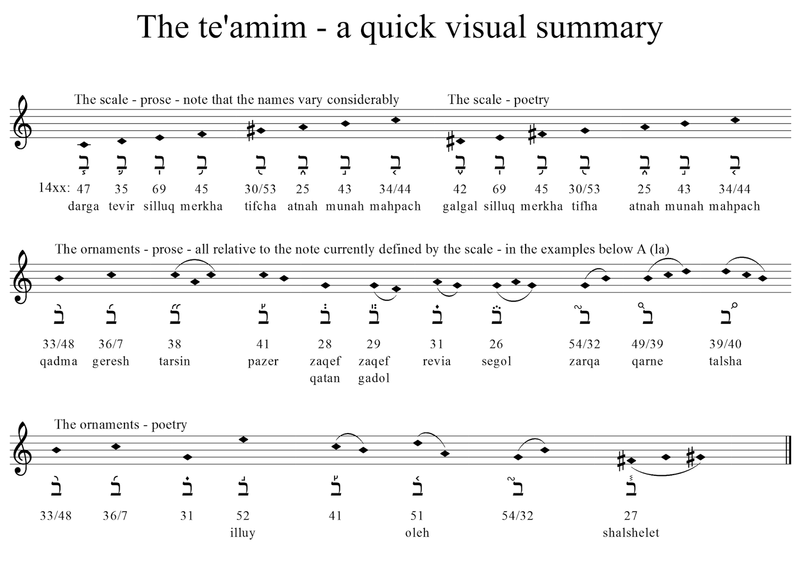 The translation in the music may differ as I play with the constraints imposed by the te'amim and a little more experience in the art. Though I said much there, there is not much need to say but to be in the gift of this Song. I have decided the easiest way to publish this and keep it up to date is to do it as pdf's - so part 1 is here and part 2 also. The remaining parts will reveal themselves in due course. 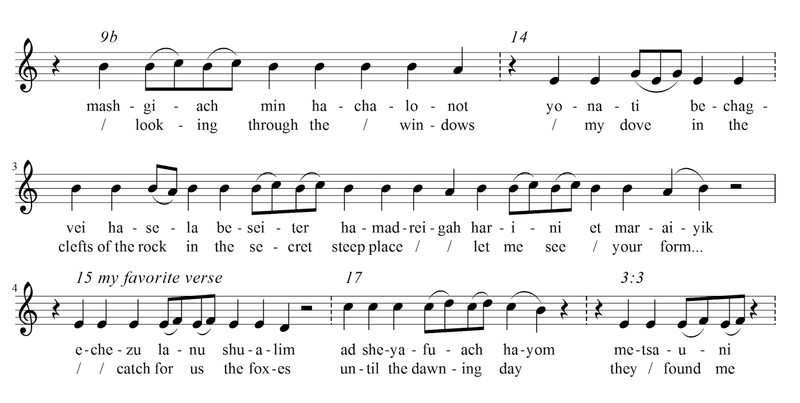 In part 2, I have left the Hebrew showing in square text so that the derivation of the music and transcription is clear. This way I don't have to say anything. Some may be interested in this University of Jordan Inaugural Newsletter also. It just dropped in my email and appears to be publicly available - with a special article on Petra, (not that I am attending that University, but I decided not to attend the conference in Iceland as I think I noted earlier - and they are one of the sponsors). The possibility of sharing and indeed adding files dynamically is coming along. 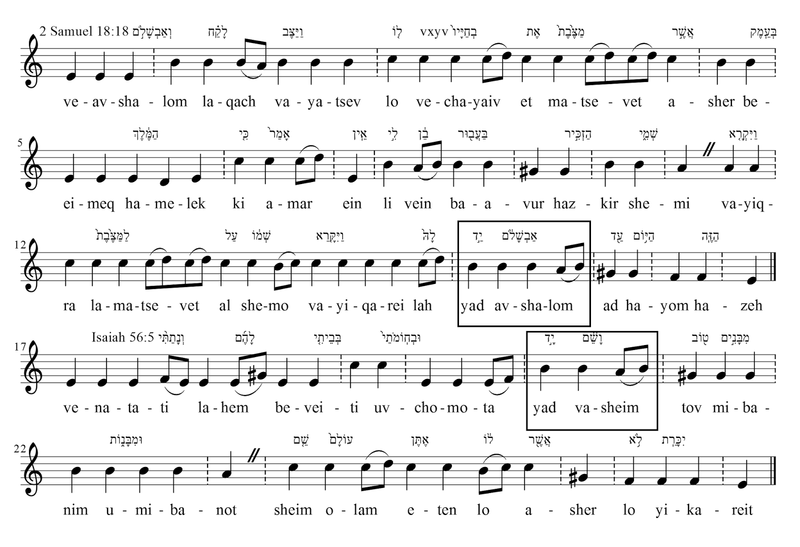 Today I extended the routine to show the Hebrew so that you can directly see how it translates into the music. The text of Hosea 1 is available at this shared resource. 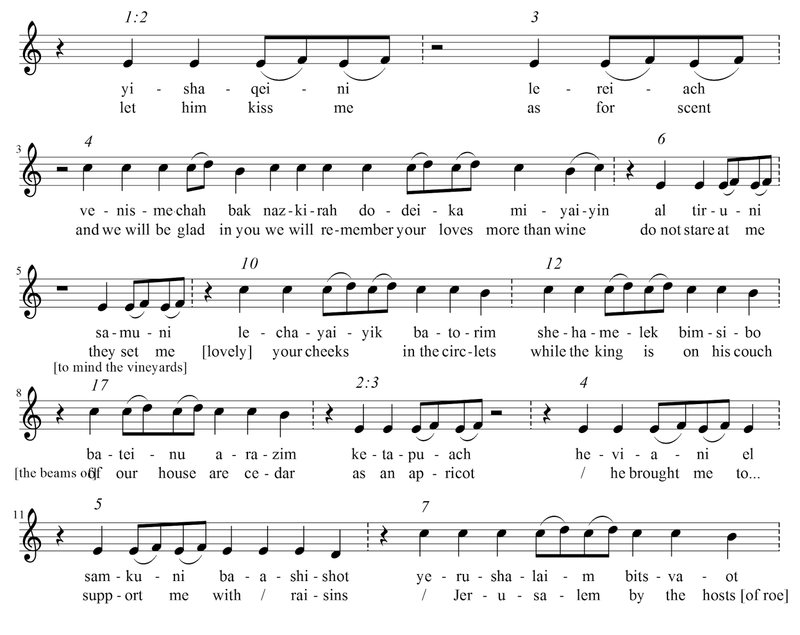 I am very impressed with Musescore that it handles the Hebrew so easily. Dodi - my beloved - what do we have here? A careful and slow read for you, dissembling nothing. Akiva calls this book the Holy of Holies. So not to be entered without that holiness that is itself unapproachable without death. Having died to the deeds of the body, therefore, approach with boldness but without presumption (Psalm 5), by the Spirit. Page 1 of 4, setting the scene, note the not disinterested chorus. We begin (verses 1 to 6) and end (chapter 2, warning) in mode 5, a D minor with its tonic on E. We continue in E minor (mode 2) and have a middle section back in D (verses 13-15). The default mode would work throughout (raised g#) but we are not interpreting this as prose. For me, the doubled qadma (verses shown at the link) is a sign of love - a kiss. And so it should be interpreted in all the prophets including Moses as well. The whole Tanach is an art song. At least that is my thesis until proven wrong. Come you punctuationists and prove me wrong - or ignore me, being so busy with your emperors, kings, dukes and counts. Do not stare at me that I am swarthy, for the children of my mother, my kin, were angry with me, so I was sent out into the fields as an entrepreneur and was not able to be a scholar. Anyway - who is my mother and my brother and my sister? There are some remarkable signs in the text. My translation is limited, watch out for reversed English word order - sometimes. 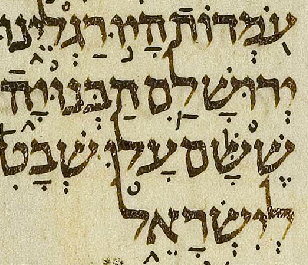 Sometimes I have to agree with the words on the ornamentation and changes in reciting note in the Hebrew, and sometimes I can get away with not agreeing with the Hebrew word order or emphasis. Yes I concur that the ornaments are emphasis, and the change in reciting note and ornaments in combination mark cadences (disjunctives!) but they are music first. Where there is a / in the English libretto, treat the note as of zero duration. Where there are many syllables for a single note, just recite them on that note. Where there is a slur and apparently two syllables, slur the first syllable and append the second to the second note. You can find the rest of the Hebrew here if you want to check my interpretation of the te'amim. Where the two syllables are under the first note, apply the slur to the second syllable. Note values (quarter, crotchet, eighth, quaver) are irrelevant. Sing to a word rhythm, but do not throw syllables away or you will leave a tear in the ribbon of sound. If the psalms are plainsong, this is Anglican chant (well sung). There is no fixed meter. The ornaments are markers of key words in the text, yet the musical line tends to the bar line - so go for it. The psalms answer the requests of verse 7. The groom encourages the boldness of these requests. Verses 13 - note the reference to myrrh. In verse 14, the word for comphire (KJV), henna (JB), is the word for cover, (כּפר) or lion, or propitiation, even mercy seat (Leviticus 16:14). This is for meditation, so I will refrain from much more commentary. Who am I to know what will be given for you to see here, daughters of Jerusalem, whether the green bed, or the fretted ceilings and the echo of the heavenly harp In sweetness magnifical and mighty? (Christopher Smart, Jubilate Agno). The lilies are of course students of Torah (Rashi) and symbolic of love, and its cost. This image draws our attention to the Psalms 45, 60, 69, 80. Note how Psalm 60 draws in its double, Psalm 108, preparing for the great mystery of Psalm 110, celebrated by the double poems, 111 and 112. Why would I assign the warning to the chorus? Is it the great assembly warning itself? But it is also the great assembly in which the Name is declared to all the kin, mother, sisters, brothers, and where the afflicted will eat and be satisfied. I could wish you beloved, no other satisfaction. But there is another large problem - just how do the ornaments work and how could you tell they were supposed to work that way? I am relatively convinced that Haik-Vantoura's interpretation of the sublinear signs is correct. It works too well to argue with it. I have not perfectly understood when to allow the silluq and when to think of this sign as a metheg. I am disturbed that it has two meanings - it spoils an otherwise quite consistent pattern. But even Lambdin, who knows nothing of the music, complains about inconsistent manuscripts (p. xxvii). I let my program assume a metheg at the beginning of a multi-syllable word if it is not near the end of a line when a silluq is expected. That means my automated (and therefore draft) music will sometimes miss a return to the tonic in the middle of a line (it rarely makes a significant difference). I have been comparing Suzanne Haik Vantoura's rendition of the Song with my computer generated patterns. There are a number of places where she applies her deciphering key subjectively. She claims she applies it without exception, but that is not true. She applies the sublinear signs without exception, but the ornaments are another matter. She admits that some things are subjective. In particular she varies the mode, sometimes even within a single section of text - choosing aolian or hypodorian in the case of the Song as it suits her ear. Maybe the stringed instrument can manage two conflicting modes (e.g. requiring both F and F#) at the same time, and she does not vary the interpretation of the sublinear signs. But she varies the interpretation of ornaments depending on how she determines to resolve them back to the reciting note and if they are doubled. Fair enough - but before I could agree with her, I would have to have processed a great deal more of the Scripture - and I hope this will not be long in coming. Her barring also is manually determined. Bars do not indicate the direction of the vocal line for her. The computer program could use arbitrary barring, but I have allowed it to highlight a change in reciting note since this carries information to a singer about the vocal line. a common cadence point called oleh ve-yored, rising and falling. It consists of an oleh (poetry only) followed by a merkha (sublinear), coming to rest then on the supertonic. It creates a suitable intermediate cadence. There are six in Psalm 32, on measures 2, 17, 33, 42, 56, 63. Notice that the cadence is approached from several reciting notes. the revia mugrash (in the poetry only) provides a very common response to the first part of the verse. It is frequent in Psalm 32 - in fact, it is frequent in all psalms except 136. Psalm 136 uses only the zarqa and that only twice on verses 4 (for alone doing great wonders) and 15 (and tossed Pharaoh and his force into the sea of reeds). In both these cases, the ornament precedes the high note and would aid the singer in energy to make the point of the verse. the qadma is often followed by a zaqef qaton. (prose only). It is curious that the Song is sparse in its use of ornaments than other books I have looked at. But to date I have too little information on the prose books to tell if one might determine the genre by the use of the ornaments. Perhaps in the spirit of the author of The Cloud of Unknowing, we should read the charge of Song 2:7 first. This charge ends four of the five parts of the Song. To read on, we must take on the persona of the daughters of Jerusalem and we are sworn by a hidden name not to rouse love till it please. I divide the Song into 5 parts,each of the first four ending with the chorus. [See the side bar for my earlier posts.] Verses are intrinsic to the text and defined by the musical signs, but chapters? - I have no idea why there are 8 chapters in the Song. In the first part there are 12 occurrences of this motif. When they begin on the tonic there is no zaqef qatan. When they begin on the 6th, there always is. Each of the following snippets should be read in context. What about part 2? Does this pattern continue? Since I did not include the te'amim when I was first learning Hebrew, I don't know without looking. It turns out there are 6, half the number of the prior part. In Song 2:9, the first is on looking through the windows. 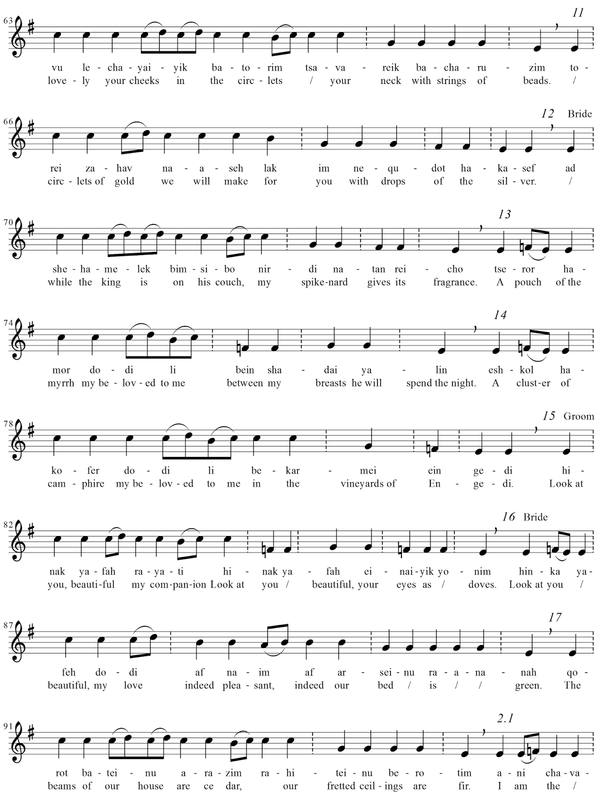 In Song 2:14, their is a 20 beat bar containing two of these ornament combinations. Verses 15 is a verse I used for years in my tag line on email - nice to see it represented, and 17 sings of the dawning day. In Song 3:3, the keepers of the city find me, and finally in the chorus, Jerusalem is painted the same way, suggesting that the love the individual finds is not separate from the love that is for Jerusalem. This prophetic motif in the music tells us more than punctuation could. I suspect parts three, four, and five will be of similar shape. In part 3, the verses are Song 3:5, 4:2, 4:6, 4:9, 4:10, 4:13, 5:3, 5:6. The ornament does not occur this time on Jerusalem. (Obviously this is not punctuation and the Wiki comment on double pashta under phonetics is shown to be nonsense. Surely one counter example will do.) Where, O where shall linguists be found (who are also musicians)? In Parts 4 and 5, the ornaments are on Song 5:15, 6:5, 6:6, 6:8, 7:1, 7:5, 7:6, 7:9, 7:13, 7:14, 8:5, 8:6, 8:8. Perhaps I will continue this by retranslating the Song with the full music - It will be a while. I see that my existing translation is far from well lined up - I have repaired these posts. 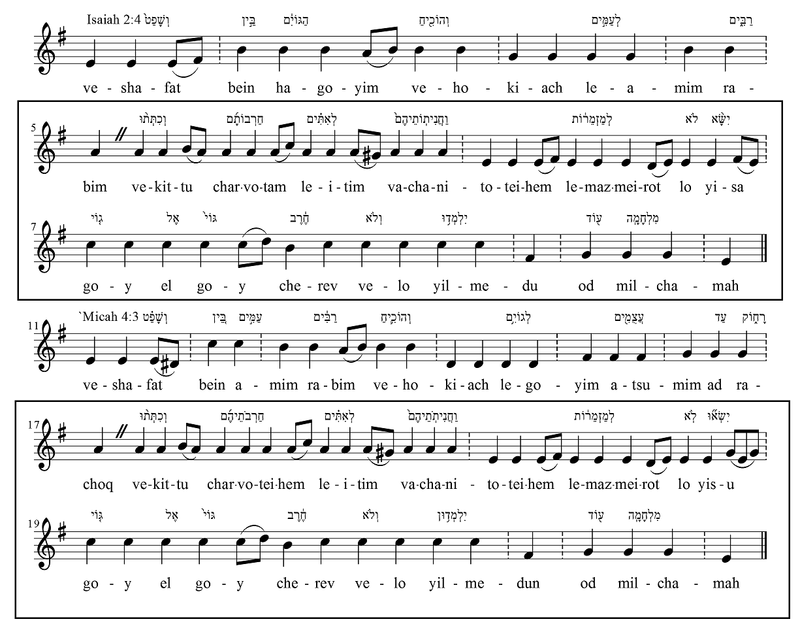 The paired pashta on consecutive syllables seems to be a particular prophetic motif in the music. 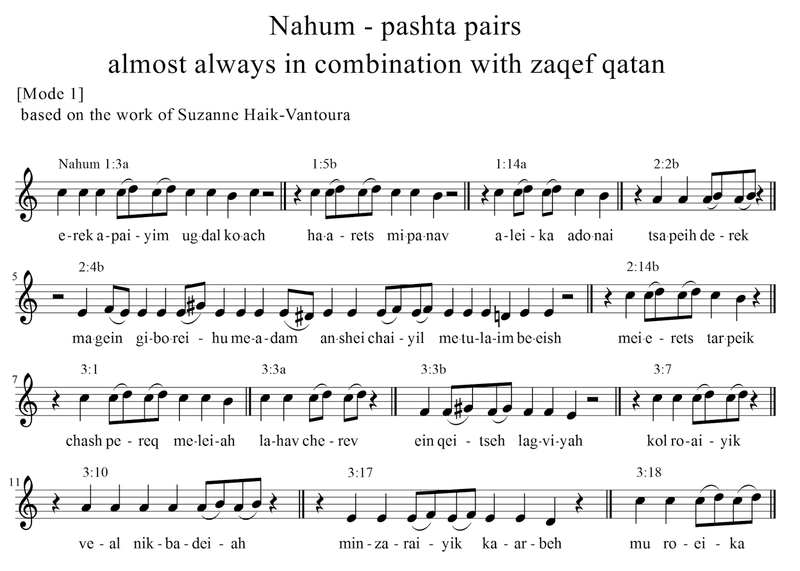 The image shows that this pairing is often combined with the single note dip of the zaqef qatan. It does not occur in the Psalms. In the examples I have so far, I found 13 in Nahum, several in Jonah, several in the Song, where it might represent a kiss (early program music - will come back to this), and in Amos, Esther, and Isaiah. 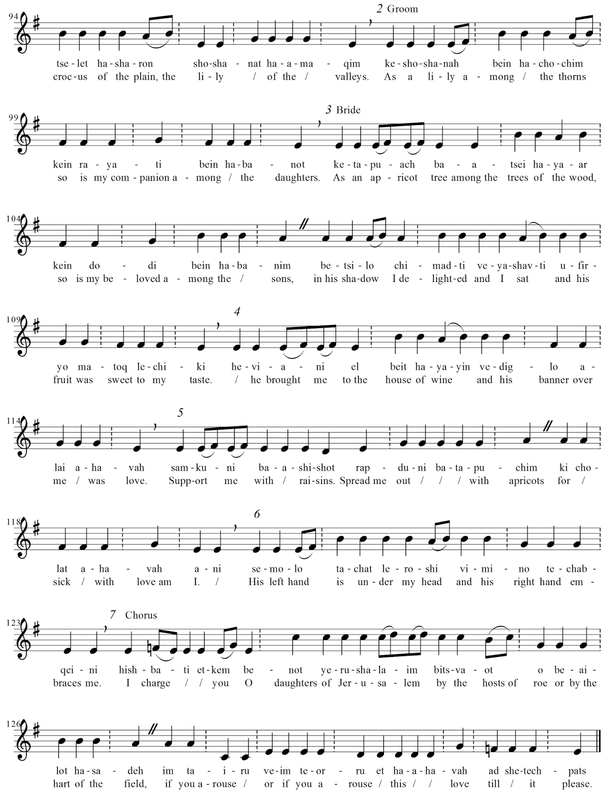 I even note one usage in the Song of Hannah in 1 Samuel 2 - showing that these poems in the prophetic books are different in their music from the psalms. The same sign is used in the Psalms, but not in a paired form. It seems that no serious student of Hebrew is taking note of Suzanne Haik-Vantoura's work. Wikipedia disses it but whoever wrote that probably has not done much analysis or listening. Can anyone tell me how an editor works when reading these ancient texts? Here is a typical modern online example of this verse - generally follows Leningrad codex. Aleppo looks like this. In the second image, there are three common signs (half-circles) that are not interpreted for me anywhere - what are they? In the white square, there is no change of note - no sign beneath the text. What there is is a conflict in the letter L. Its little brow on its hat is interfering with the vav above it. Letteris has interpreted the interference as a mehuppakh (ַ֤high C)ל֤. Haik-Vantoura and Mitchell both follow this reading. Leningrad has it as a galgal ל֪ (low d#). 'go up' might demand a higher note, but could be recognizing ambivalence with a lower note. Some note change seems required. From the image of Leningrad, it almost appears that the lowest half-circle, the one to the right of the interfering letters in the white square (left) is being read as the sublinear sign. But I would have read the circle as a munah ל֣ (B) rather than a C. So the interfering ל֤ in the line following the current line was given as a note! The music - uninterpreted is above. I wonder why I persist - Is anyone reading who gets my question? 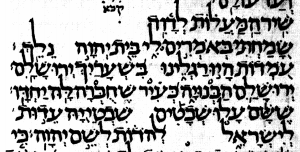 If you believe the te'amim are punctuation, then Psalm 140:12, the final sentence with the atnah in the middle of it, has its subject disjunct from its verb. In punctuation this would be silly. In music, it is just fine. Especially if you are used to a rest mid-verse to contemplate the tension. 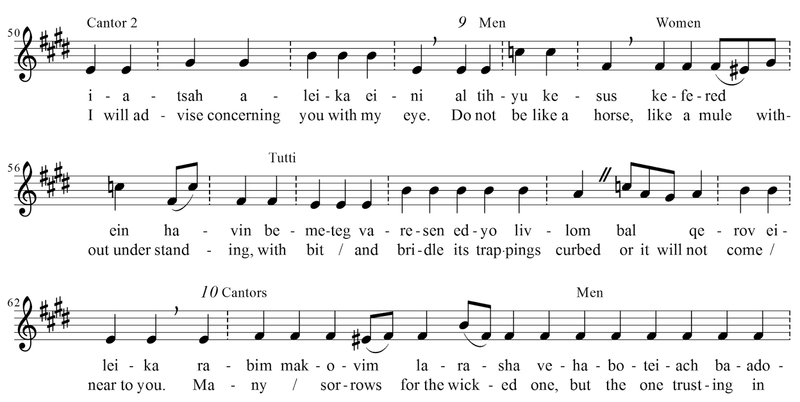 Note the cadences in the music: on ba-arets, (in the earth) a mid-phrase minor cadence, on ra (evil), the rest-point in the verse, and as inevitable, the full close at the end of the verse. This analysis concurs with the Greek and other more recent translations according to this article from the Hebrew annual review, an open access journal. (Thanks for the link to James McGrath). Greenberg suggests the image of driving gazelles into an enclosure to understand the verse. A number of his cited translations fit the Hebrew syllable rhythm rather better than mine, particularly the old JPS will pursue with blow upon blow. Whether blow upon blow, or urgently, some urgency is required to destroy violence in us.